I love that this dress has a rather simple shape, but a really interesting print (it was originally $89 and is on sale for $22 right now on Macy's!). It's kind of hard to tell, but they're spots and flowers. 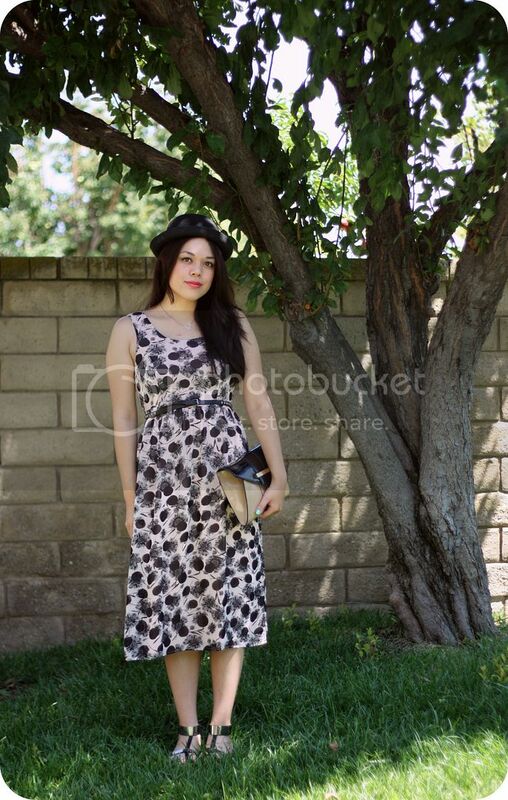 I styled it with my new woven bowler hat from Urban Outfitters (I got it on sale for about $10 in-store, but it's available online too), a studded black belt, the clutch my best friend got me for my birthday, and my Prabal for Target sandals. It's been hard going back to work this week after my little New York vacation (I wish we could've stayed a little longer!) --I even started working more hours so it's been a bit of a long week. Although, it really does feel good to be productive!